Australian doctor Saschveen Singh witnesses the toll of malaria and malnutrition on people living in Nduta refugee camp, Tanzania. The worst malaria cases are seen in children: many with complicated cases requiring blood transfusions and intensive emergency care. I arrived to the project in Nduta just after the rainy season ended, expecting the malaria rates to have started dropping. But to my surprise, we saw another surge of malaria after the peak time. Although I was prepared to see many cases of severe malaria and was well versed in the emergency management of these cases, it was quite overwhelming to see how many admissions we had on the wards, to see the outpatient area absolutely overflowing with patients, and the number of our Burundian staff succumbing to the disease. The worst of the cases are tragically always in children. Our paediatric ICU was filled with kids with such complicated cases of malaria that they were having convulsions and haemorrhaging blood in their urine, requiring blood transfusions and intensive emergency care. The most severe cases, even if they survive due to treatment, often have long-term secondary effects that can haunt them for life, such as brain damage and other essential organ damage. Seeing kids on the ward in this state was gruelling, to say the least. Malaria is a truly awful disease that is hugely prevalent across the world: approximately 3.2 billion people (nearly half of the world’s population) were at risk of malaria in 2016, and approximately 445,000 people die from malaria each year. Some 90 percent of those deaths occur in Sub-Saharan Africa, and 70 percent of those deaths are in children. Here in our project, it is one of the most common illnesses that we treat, yet still, one of the biggest challenges to prevent as it requires a combination of public health measures such as health education, insect control, distribution of mosquito nets, and early diagnosis and treatment. Meanwhile, back at the MSF house, I feel very lucky indeed, taking my anti-malarial tablets every day and sleeping soundly under the protection of a mosquito net. Refugees, however, do not always have access to these precautions. Malaria traps people in an unfair cycle of suffering and illness. Huge efforts are required to ensure that people have access to health promotion messages, adequate insect control measures and mosquito nets, but these interventions are costly and difficult to sustain in an ongoing crisis. The nets need frequent distribution as they get damaged with time, and many families I meet are currently living in tents without them. Recent food ration cuts are also starting to take a further toll on the people here. The lack of adequate food is a very significant concern in the camp, so we are keeping a close eye on the nutrition rates of the community. Malnutrition affects all systems in the body including the immune system, making people much more prone to infectious diseases—and vice versa, these infectious diseases can also lead to malnutrition. So we frequently admit patients, including children, with chronic diseases such as HIV and tuberculosis along with malnutrition. 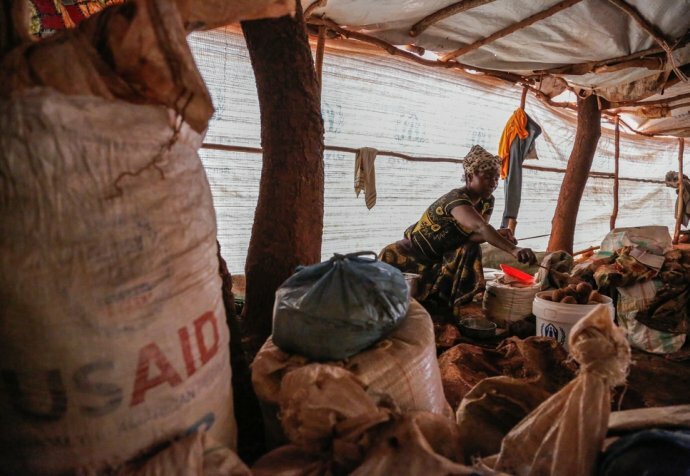 “The worst of the [malaria] cases are tragically always in children"
Tired and desperate families often wait out in the open for long hours to pick up their rations, and if there are long delays or if the distribution points run out of food, then frustration and anger can rapidly rise. The despair of the hungry people here is intense. For now, a few months after the peak, the malaria rates have dropped temporarily. But with another rainy season rapidly approaching us yet again, we are already in preparedness planning mode and bracing ourselves for the next waves of malaria to hit our little hospital.